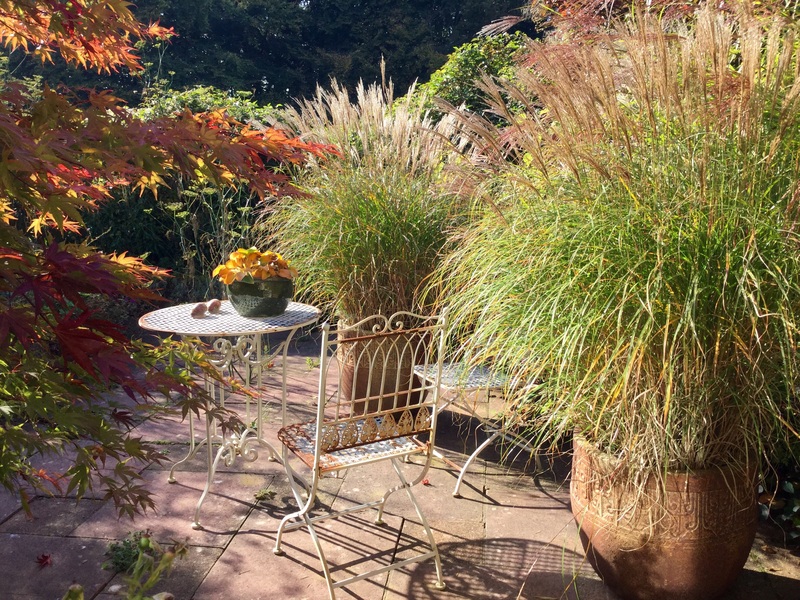 As I love Miscanthus sinensis I’m delighted when people express an interest in growing them in their gardens and the ones that appeal most are dwarf forms. 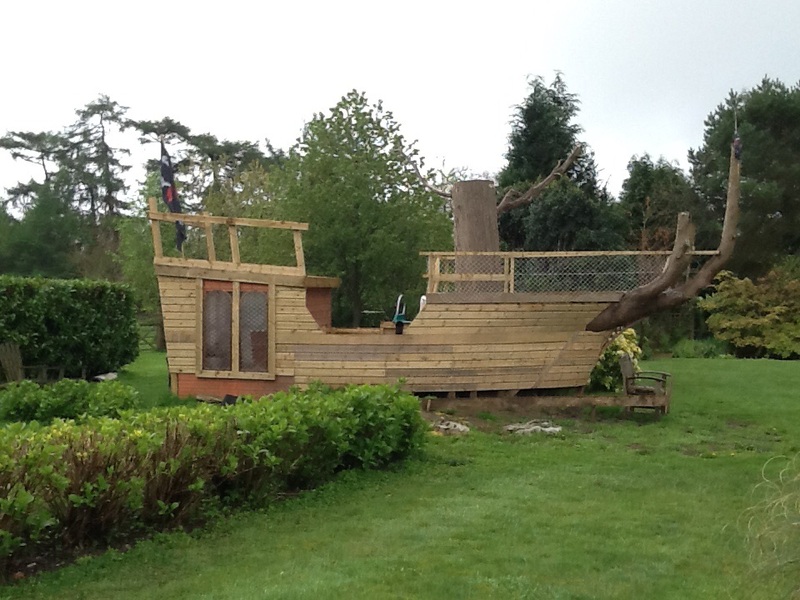 They are diminutive, beautiful and versatile: make great hedges, look fabulous in pots, associate easily in mixed borders of shrubs or perennials alike, and, as great landscaping plants, would create a grassy sea of waves around the base of the pirate ship below. There are many cultivars of what are referred to as the ‘Yaku Dwarfs’ avaiable, of which I grow several and there’s no doubt that if it’s infloresences that count, they’re looking at their best right now. The question I’ve promised window shopping garden visitors to consider is : which one to choose? Even if I was Snow White, I’d have a hard time telling these young dwarfs apart. From left to right, between the red persicaria, they are Miscanthus sinensis ‘Adagio’, ‘Cindy’, ‘Starlight’ and, unfortunately named, ‘Gnome’. All are very similar in habit, foliage and flower because they are so intimately related to the non-clonal seed raised strain originating from the Japanese island of Yakushima. Recent cultivars have been selected to flower freely, a marked improvement on traditional cultivars that were “shy” to flower in cooler, greyer climates. In a couple of years the mixed group will look almost identical to the mature ‘Starlight’ planted around the seating area in the Dogs’ Paddock, by the end of September the hedge is smothered in gingery plumes that turn gold as winter sets in. Introduced by Knoll Gardens in 2012, ‘Starlight’ made quite a splash in the horticultural world. On release it was reviewed by owner Neil Lucas in this post . Last year ‘Starlight’ was superceded by the equally stunning lookalike ‘Cindy’. Neither ‘Starlight’ or ‘Cindy’ are easy to tell apart from ‘Little Kitten’, jostling for space among the hydrangeas on the right and looking more silvered as seed ripens. Both have charming and endearing names which may be as good a reason as any to select them. Slightly more distinctive, at least to my eye, is the pair of ‘Adagio’ in large pots on the sunniest part of the patio. As I haven’t got a mature ground grown specimen with which to compare them, I can’t be sure that the more upright stance and narrower foliage is a quirk of being confined like this or not. Although it’s nice that this one has an AGM, this shouldn’t exclude those more recent introductions that don’t – others simply may not have been trialled yet. I can never pass a good one by, recently I spotted these ‘Yaku Jima’ in Homebase and they just had to come home with me, not because of the illustrious name but because their roots were bursting from the bottom of 2 litre pots and promised a head start if planted this autumn. Thanks to modern breeding programmes, all these cultivars will flower freely from late summer onwards above elegant arching mounds of foliage that stand at about the same height. Regardless of descriptions, I’ve yet to meet a mature one that, in leaf, limbos beneath the magic 1 metre bar. Unless, that is, they’re languishing like the one above. What’s ailing a friend’s litter of three year old ‘Little Kitten’ is a mystery, they’ve made little progress since they were purchased in 2012. Bought from the same reputable nursery as mine, at about the same time, and having been well cared for, they should be towering above the container by now. Perhaps life in an albeit large pot on an exposed south facing terrace makes them needier, especially for water and, possibly, for humidity. 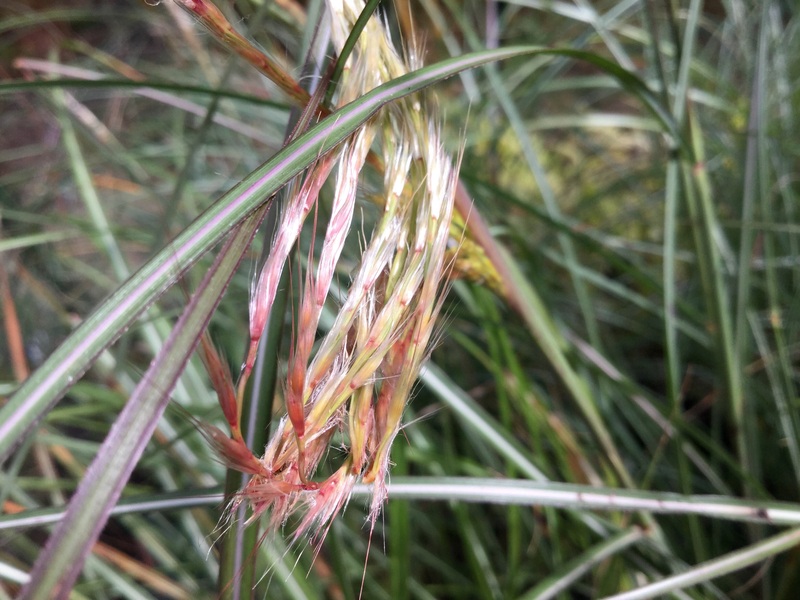 Grasses curl their leaves and discolour at the leaf tips when stressed by drought, and, if uncorrected will become unseasonally dormant, turning brown until conditions improve to stimulate new growth from the base of the plant. 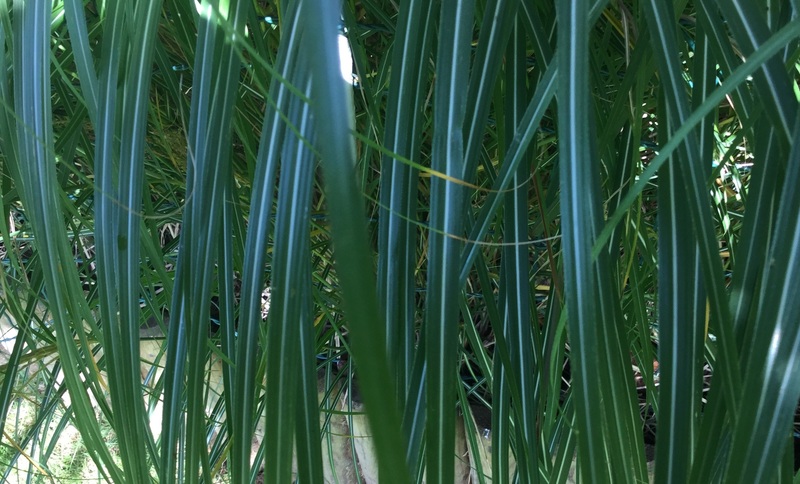 Miscanthus sinensis leaves in active growth should be green with a prominent silver median stripe. 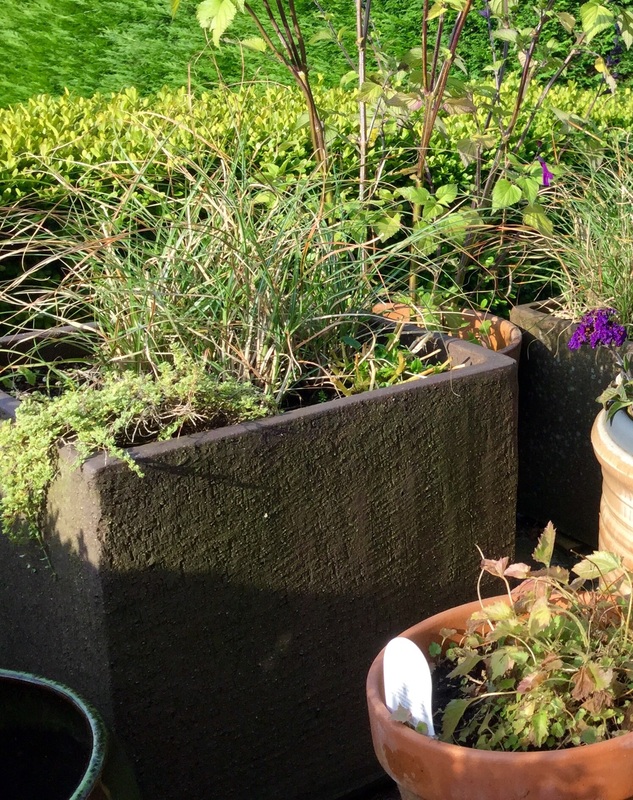 Ultimately, pot grown specimens are most vulnerable to stress, and although ground grown grasses are generally highly tolerant once established, it pays to monitor the watering in the first year or two until deep root systems are developed. Autumn planting is an advantage in this respect, while soil temperatures and light levels are high, plants put on growth below ground with the bonus that nature will help water them in. If a grass is not thriving in a pot, I’d try it in well cultivated ground. If space allows, slightly taller, technically medium height alternatives are often easier to tell apart. The classic ‘Kleine Silberspinne’ is notable for its fine form, spidery foliage and, a crowning glory of rich, red tinted awns. Sussex Prairies has a stunning mass planting of this one, planted as a broad band separating the mixed perennial borders. In the end, choice is often determined simply by what’s on offer. Independent nurseries or good commercial retailers may fill a special order and, as autumn is a great time to buy and plant, specialist nurseries can supply by post. If large numbers are required, try a wholesaler. I think the hallmark of a good dwarf miscanthus, is a free flowering habit, beyond that, this family of dwarf Miscanthus sinensis is graceful and useful, but bear such a strong resemblance to each other that my greatest concern is keeping track of the labels. 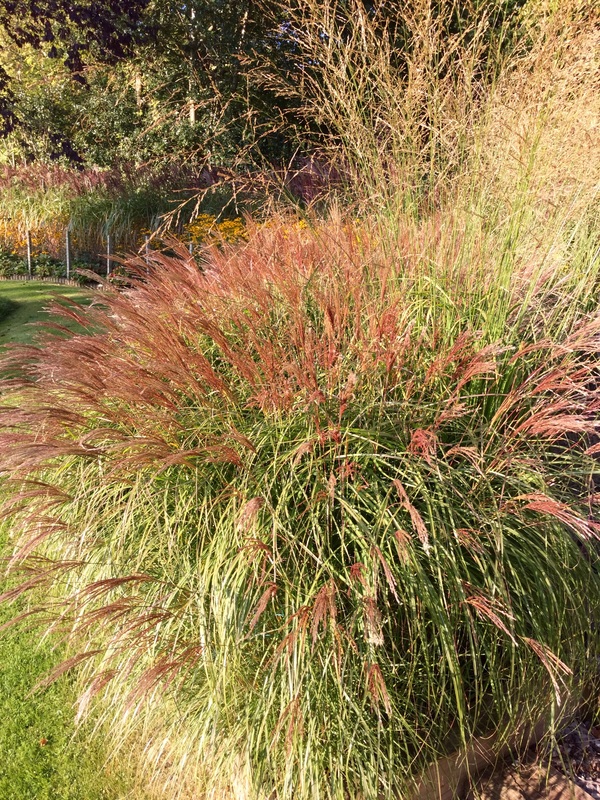 What a wonderfully informative post about these wonderful grasses. I have a few but I have forgotten their names. They are all good at this time of the year though. Grasses do come into their own in autumn, don’t they? With the wonderful light we’ve been enjoying this year there’ve been looking extra special. You have such an extensive collection of treasures, it’s good to hear you grow grasses too. Some lovely forms of grasses! I pass on your post to my daughter as she designs gardens, mainly on the wild west of Auckland and mainly NZ natives. She has recently refreshed a border at her home with grasses. There is a sad round-a-bout near me with stubby grasses. Hope they pick up over spring time or get replanted. Our motorways are being planted thickly with natives, including grasses and are looking great. Corridors for birds! A bit frustrating when they decide to alter or widen and rip up the mature plantings! I feel sorry for the plants! However they replant again with natives. Adds to Green NZ! I know what you mean about neglected roundabouts looking sad, although we do have some good ones near us that are quite inspirational. It’s great that motorway embankments are becoming green corridors worldwide … Maybe mall carparks will be the next to enjoy a make-over? Such an interesting post, many thanks for this information. 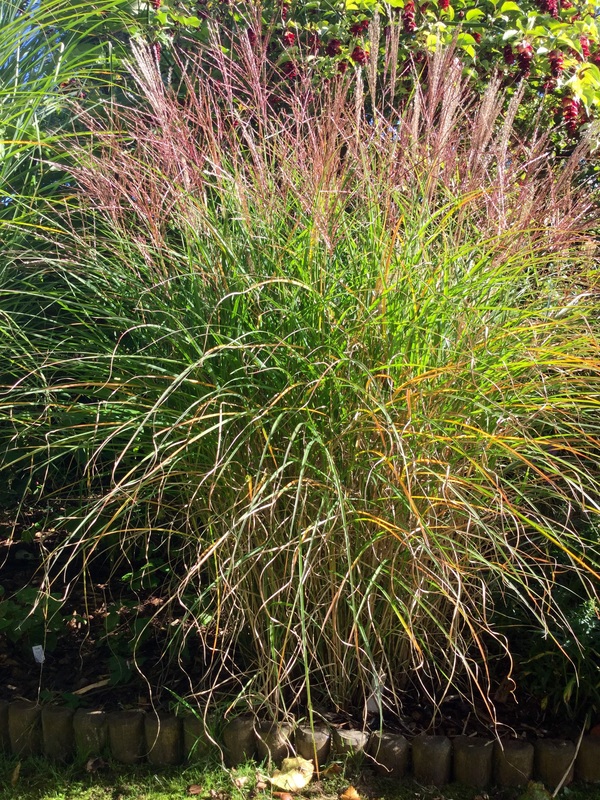 The only Miscanthus I have are all tall ones so I must find M. Starlight, it is so gorgeous! Good luck with your search, Knoll Gardens stock it, if you can’t find it elsewhere. If you bump into another cultivar that’s looking good, grab it while you can! There are certainly some beautiful cultivars out there. You have inspired me to use them more often. Thanks, Kate. 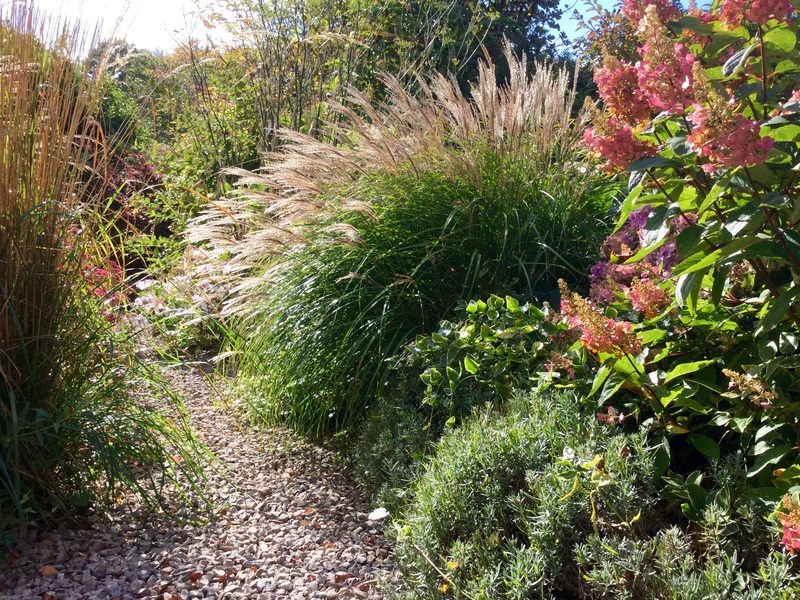 Dwarf miscanthus are inspirational and much more reliable than they used to be, we’re lucky to be spoilt for choice. You must come across them quite often in your travels? You don’t see them all that often in Australia. I think partly because they prefer not to be in very dry soil and partly because many of the cultivars are simply not grown here. I have seen them more in other countries, but haven’t really got to know them on first name terms! I’ve also chosen some dwarfs this year and look forward to seeing them keep their promise! Your garden is very pretty, I especially love the pic with the terrace and the grasses, beautiful! The adagio in pots make all the difference to that corner of the terrace, they’ve been stunning this year thanks to the warm autumn light. I hope your dwarves behave well for you, it’s good to hear you’re growing some too. Miscanthus are my favourite of all the grasses although this year mine all went dormant during the extreme drought this year, but usually they recover. I don’t have any dwarf ones and if I’m sensible I properly shouldn’t seek any out, but……….! Do you think growing dwarves in shade/irrigated containers might work for you in Italy? It’s promising that the taller cousins go dormant in the ground and then pick up, makes me wonder whether if this might work. I think I recall you saying arid air is drying for many plants too … I notice leaves are greener for longer in shadier conditions even in my garden. Lovely to hear from Chrisitna, an interesting challenge. Grasses are hard to find on nurseries here anyway so I doubt I would find any, next time I’m here in the UK I’m hoping to be able to visit some nurseries so I might well be tempted. This was very helpful Kate and I will definitely go looking for a dwarf miscanthus for a pot next year. Thanks, Alison, I hope you find a nice one to adorn a pot. Because they’re slow to get started, I started the Adagio at three per pot and will divide them next year, late spring. One might be enough if you have more patience than me! The dwarf varieties make a lot of sense and are often easier to find a place for. Having learnt a valuable lesson with my sole pheasant’s tail grass on the bank I am now looking for areas where the larger grasses would look good planted in groups. I agree compact forms of Miscanthus sinensis are easier to accommodate and more versatile if space is limited. They look so demure in 2 litre pots on sales benches, it can be hard to imagine how large they can get. If you’ve got the space that do look stunning in groups especially from late summer until late winter/early spring. You’re welcome, Cathy, and quite right to raise the issue of ‘dwarf’ being a relative term. I suppose it also depends on whether you’re looking to add to the vertical dimension of a garden too? There are some tall cultivars that are great for doing just that. 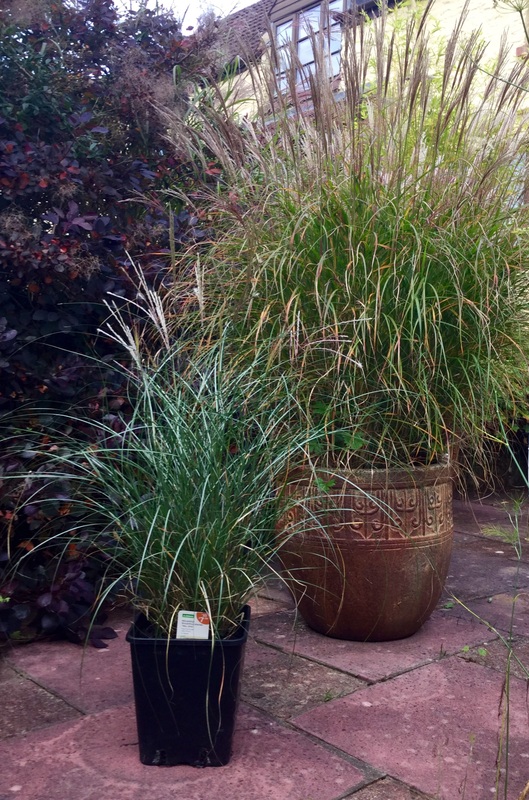 Inspired by our meeting today at The Plant Specialist, Great Missenden I have now got Miscanthus sinensis ‘Adagio’ to try in a pot and your generous gift of Miscanthus sinensis’ Gnome’. Thank you Kate. Your knowledge of these and other grasses is inspirational. What a lovely comment, thank you. What a fabulous nursery! BTW Have you used hydroleca clay balls in pots? In one this size a generous layer cuts down on the watering and holds nutrients. No I haven’t. I shall order some, thanks.